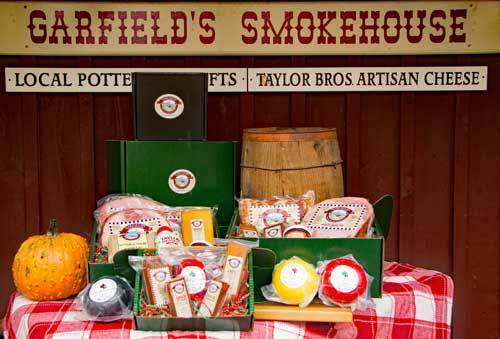 Our gift boxes are filled with a variety of our products, and are perfect for anyone on your gift-giving list. We offer decorative boxes for shipping to help gift giving to the person that has everything! 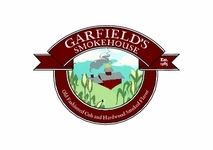 The cheese sampler has an assortment of smoked and farm fresh cheeses.There is a 7 oz smoked cheddar bar, 9 oz smoked original cheese, 1/2 lb Taylor Brothers Jack & Gouda and Taylor Brothers Jack with Garfield's Smokehouse signature corn cob and hardwood smoke added. Terrific for a gift or cheese board. The Snack Pack box has everything you need to host a gathering.Just add mayo and sour cream to dips and crackers for the cheese and pepperoni and you're ready! The Breakfast Box has a 8 oz smoked cheese bar,l lb. smoked ham steak, 1 lb. smoked bacon, buttermilk pancake mix, pint Taylor Brothers maple syrup, Sidehill Farm jam. Deluxe Gift Box has the same variety as the Breakfast Box but more! This is terrific for a bigger group.This box has 1 lb. smoked bacon, 2 lbs ham steaks, 1 1/4 brick smoked cheese, pint Taylor Brothers maple syrup, buttermilk pancake mix, and Sidehill Farm jam. 1 lb wheel of Cloverland Colby Rosemary & Red Pepper-a mild cheese similar to cheddar but softer and moister with a punch of spices. 1 lb wheel Mill Hollow Gouda- perfect for snacking, grating or grilling in a sandwich. 1 lb wheel Evelyn's Jack- semi-hard style cheese that becomes sharper with age.